"Our mission is to completely re-write the science of flight management for the 21st century by precisely meeting the emerging requirements of cost-optimized airline operations, trajectory-based operations and reduction of emissions. Our research takes place in a corporate climate that promotes innovation, continuous search for excellence and ensures we have fun in what we are doing. Our focus is on affordable, user-friendly systems that provide the ultimate level of cost optimization and integrate seamlessly into future airline operations and ATM systems. FLIGHTKEYS 5D - as the only 21st century flight management system - will balance airline network throughput, greenhouse gas emissions and safety in the most cost-efficient way and covers a scope far beyond any solution currently available on the market. By improving communication and collaboration amongst stakeholders in the aviation industry it will lead to a smarter and more productive use of aircraft and airspace. Our vision is now swiftly taking shape in an unprecedented clean-sheet development approach with a fast-growing team of top software developers and aviation experts. So watch us closely, or feel free to invite us to present our new 5D solution." BRINGING IDEAS DOWN TO EARTH. Started as a research project, FLIGHTKEYS is now progressing fast in developing the trajectory management systems most of you have been dreaming about for years. 5D is being built to meet the challenges of today and tomorrow. We are convinced this is the industry’s only chance to get a completely new system built from scratch with future ATM complexity in mind. Usability and user interface design. Patrice ensures that 5D has the required flexibility and capability to meet global aviation regulations and airline requirements. Former head of training and system expert at Flugwerkzeuge Aviation Software GmbH (f:wz). 25 years airline operation experience. Flight dispatcher Instructor and Aircraft performance specialist. Also worked as an Aviation Consultant, specialized in flight operation efficiency. Holds a flight dispatcher license. Directing the daily development business, responsible for aviation environment data management, verification and validation and database structures. Head of Support/Delivery and Aircraft Performance at FWZ. SESAR contribution in WP11.1 since 2010 (Free Route, Ensemble Weather Forecasts, EFPL, CDM, UDPP). Active ARINC633 AOC subcommittee member since 2012, FIXM ATMRPP contributor. Active glider and touring motor glider pilot. Responsible for corporate strategy, aircraft performance, cost-optimized flight operations and future ATM concepts. Education in aeronautical engineering. 30 years of airline pilot experience (Austrian Airlines DC9 - A340). Flight accident investigation experience, Cost-index flight operations pioneer, developed one of the first flight planning solutions in the 1980s. Co-founder of Flugwerkzeuge Aviation Software GmbH (f:wz). SESAR background, active touring motor glider pilot. Responsible for Marketing and Sales, Quality Management and Controlling and supporting Product Development. ATP, Vienna University of Economics and Business. 20 years of experience in Aviation Management. Director Dispatch and OCC @ Austrian Airlines. EMEA Sales @ Sabre Airline Solutions. Director Sales @ Swissair Flight Support. @ Lido FlightNav and @ Flugwerkzeuge Aviation Software. Responsible for architecture, interoperability of services and operations. Areas of special expertise are in optimization, alerting and event handling. Co-founder and CTO of Flugwerkzeuge Aviation Software GmbH (f:wz). 30 years of experience in software development with 25 years in flight planning. Profound knowledge of airline operations and the required IT infrastructure. Studies in Computer Science on the TU Wien. Helps to define FLIGHTKEYS’s future strategy, promotes our business, manages company operations as well as investor and customer relations. 20 years in management positions. Business Angel Investor in India, Singapore and CEE. Education in Business Administration, Marketing and Aviation (BA & MBA). Working on the mathematical and algorithmic backbone. Coordinates and oversees implementation of flight rules and procedures. Ensures compliance with aviation regulations. Studies in computer science TU Wien. Co-founder of Flugwerkzeuge Aviation Software GmbH (f:wz). 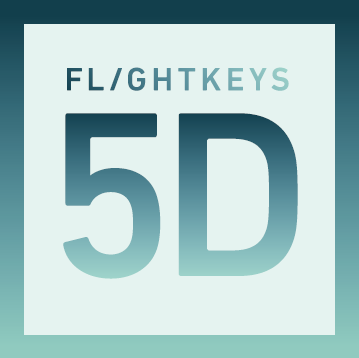 Having developed flight planning systems for more than 30 years, the FLIGHTKEYS team has the background to ensure that 5D will meet the basic requirements of trajectory management and flight planning systems. We think that features like fuel tankering, ETOPS, Terrain avoidance scenarios, precise overflight fee computation, tailored NOTAM and weather briefings, consideration of weather hazards, etc. are basic features and do not have to be explained in detail. 5D will be built on top of these standard features and drive them even further. Nevertheless, we would be glad to hear what you miss in your current system. Please don't hesitate to contact us! In addition to the 4D space covered by traditional flight planning solutions, 5D extends the calculation space into a 5th dimension. Uncertainties in surface weather, traffic and cost prediction is modelled into statistical functions based on a continuous analysis of actual flight data. For upper air weather, multicasting weather products are introduced to compare multiple scenarios and automatically apply suitable strategies, e.g. adaptive fuel reserves and delay cost reduction. One-pass trajectory optimizing is the holy grail of flight management systems and was considered unachievable when the currently existing systems were developed 20 years ago. Therefore, traditional systems optimized in 2 steps: First, a lateral route was created with rudimentary aircraft performance data to consider upper air weather, overflight cost and airspace constraints. Second, vertical and speed optimization was applied on this pre-defined route. As the only 21st century flight management system, our one-pass optimizer creates the trajectory in full resolution with dynamic aircraft performance data, precise overflight fee formulas and probabilistic cost functions in a single pass, thus avoiding any issues of vertically unflyable routes, inaccurate overflight cost and on the other hand provides significantly improved optimization accuracy at the same time. By applying newest technology and advance algorithms, we can achieve a significant calculation speed improvement that enables repeated, automated optimization runs whenever triggered by external conditions. 5D is based on a completely new paradigm - it really simulates the trajectory and calculates required data from original airplane and engine characteristics. Those characteristics are laid down in high and low speed lift/drag polars, thrust/altitude characteristics, thrust/fuel behavior and many more. 5D performance engineering tools distill basic characteristics of an aircraft from manufacturer’s data in an elaborate way and these data can be further refined through our advanced APM (aircraft performance monitoring). With these data and the associated complex algorithms, 5D becomes extremely flexible and accurate in all performance calculations. Alerts and warnings are an important method to inform the user on potential issues associated with the planning. There are both internal and external events and status changes that can result in an alert. The severity or applicability of such an alert highly depends on the type of operation and the workflow in dispatch and collaboration with the cockpit. Also a lot of the reasons for alerts could be self corrected automatically or semi automatically. We designed a 3 layer event / status processing and configuration system that will allow free configuration which events in conjunction with which statuses will result in an automatic action and / or alert and warning. Based on the setting the system can provide a very concise set of necessary alerts and wherever possible already suggest a “one click acceptance solution” to keep the workload of the dispatcher as low as possible. Automatic solution of issues and direct alerting of the cockpit can be driven within the same set of settings. 5D allows to view flights not as singular entities anymore, but as participants in the full traffic picture, with tools to ensure passenger, load, crew and aircraft connectivity, as well as trajectory optimization around potential traffic conflicts. In-flight monitoring alerts for potential encounters and in-flight re-optimization allows to resolve conflicts in real-time, with increasing strictness applied as an encounter gets closer in time. This advanced concept will shift the handling of traffic flow management from ANSPs to airline operations centers. 5D is built on a state of the art micro service architecture where monolithic components are avoided as far as possible. This enables the system to run in any cloud or cloud-like infrastructure, either hosted by FLIGHTKEYS or hosted by the customer. Due to this distributed architecture, the server infrastructure requirements are much lower compared to other trajectory or flight management systems on the market. 5D furthermore has a fully web-based user front end that can be accessed from any computer, tablet or even smart phone. 5D bridges the traditional gap between ATM flight data processing and airline operations management to the point where 5D creates pre-deconflicted and cost-optimized trajectories. It will be the only system that fully supports enroute CDM, enroute UDPP and DARP. While ATM is focused on local processing and sector load balancing, airlines are operating globally and need to have the full picture, including all other traffic potentially affecting their flights. Enroute CDM automates the communication process for rerouting airborne flights and allows to negotiate route proposals with ANSPS and upload approved trajectory revisions to the aircraft. Due to the high level of automation, both controller and dispatcher workload is reduced. Real-time airport suitability monitors availability of airports and runways from the pre-planning phase to landing. This includes active NOTAM and weather monitoring as well as published opening hours. Dynamic planning minima (ex. Alternate or ETOPS minima) are derived from available runways and approaches at the planned arrival time, using user configurable rules. 5D Analytics is an advanced flight planning projection tool powered by the FLIGHTKEYS 5D engine. The tool is designed to provide high quality flight data prediction for analysis of new routes. The route analysis uses up to 10 years of historical upperwind data. In addition to the flight data (time, payload, cost, etc…) the result also includes the location of the most probable optimum route, which highlights potential overflight permission requirements. In addition, a user friendly aircraft performance interface allows users to import any aircraft performance data, from simplified table-based to digital data format. The “5” in 5D denotes an additional probabilistic dimension beyond the classic 3 space + 1 time dimensions. And probabilistics play the key role in a trajectories’ life cycle. Every flight gets calculated and optimized multiple times - from weeks before the actual flight to actual landing and then post-flight evaluation. During the entire lifecycle of a flight, a vast amount of events take place that may change the status or the parameter of a flight. These events may be triggered by 5D components, other systems, user interaction or data coming from the aircraft. 5D’s revision and event traceability concept ensures that all these events and changes are traced, stored and available at any time. Precise Aircraft Performance Monitoring is a cornerstone for accurate and efficient flight planning and safe reduction of contingency fuel. To get the highest benefit from 5D ‘s advanced aircraft performance algorithms, 5D APM applies exactly the same algorithms when comparing recorded aircraft performance with predicted values. As one of many additional benefits, advanced APM reduces scatter and provides more meaningful results. 5D APM uses high resolution QAR data and combined with full flights dynamics it creates useful results even for flight segments that do not fulfill stabilization requirements, thus increasing the size of useful samples significantly. FIXM (in support of ICAO FF-ICE) will bring 5D’s global trajectory management capabilities into a globally interoperable state. Apart from the evolution of the 4D trajectory (as it exists in the Extended Flight Plan) an integral part of FIXM will be the GUFI (Globally Unique Flight Identifier) which is issued for each planned flight. 5D’s flight identification architecture fully integrates this concept and opens the door for a global flight plan filing and validation system. Flight Data Processing Systems, as used within Air Traffic Control Units can easily integrate 5D’s trajectory generation, monitoring and revision engines via this global standard. 5D is coming with an integrated dynamic policy editor and evaluation engine which puts an end to hardcoded planning policies that are time-consuming and costly to change. Policies like fuel, planning or alternate selection policies are manageable by the user via a graphical interface. You can create or edit any policy using building blocks and conditional flow charts with just a few clicks. As the GPS satellites themselves have evolved over the years, so have the systems that allow operators to take the benefit of satellite navigation. SPACEKEYS presents the ultimate evolution of GNSS RAIM prediction solution. It provides for worldwide RAIM predictions for all aircraft types and for all navigation and surveillance specifications. SPACEKEYS is a project funded by ESA under the NAVISP programme (NAVISP EL2-007). The RAIM solution performs predictions for all currently known receiver types in commercial aviation. This includes receivers compliant with TSO-C129, TSO-C196 and TSO-C145/146. The system is Future Ready For Multi-Constellation Receivers and Advanced Horizontal RAIM. The RAIM solution performs predictions in compliance with the all currently available navigation specifications. Terrain screening is performed as required for RNP AR predictions. Predictions are performed in compliance with the FAA ADS-B 2020 specification AC90-114A. As other Worldwide surveillance requirements are developed the system will ensure all requirements are complied with. For RNP-AR approach procedures not only the satellite constellation needs to be considered to predict the achievable GNSS accuracy, but also the potential obstruction of satellites by the surrounding terrain. Spacekeys dynamic terrain screening engine analyzes the surrounding terrain for every RNP-AR request to ensure compliance with this requirement. The main advantage is that any new RNP-AR approach at any airport globally can be RAIM checked right away. A unique feature, that will only be available in Spacekeys RAIM prediction, is the pro-active RAIM prediction monitoring. This will enable flight planners to react to degradations and improvements even if they no not re-check RAIM for a given flight. Flights may be monitored and alerts generated for flights that are pre-flight, but also during the execution phase. 99.95% system uptime guaranteed. 100% within the last 6 months achieved. New Almanac processing within 2 minutes. New NANU processing within 4 minutes. Average 500 requests per aircraft registration and day (fair use) (No request limit on dedicated systems). work for customers around the world, we would be excited to hear from you. Ability to read and understand NOTAMs and AIPs and good knowledge of the Eurocontrol environment.